Tan has always been a great color for going out on an adventure. It's perfect because it's a nice light color to keep the suns rays from melting you body into nothing but also a classy enough color for someone to invent a lovely pair of pants whose name nobody can spell. Yes, we're talking about khakis (you don't want to know how many times we wrote that before we got it right.) Nothing spells out an aristocrat going on a grand safari or archaeological dig quite like an all tan outfit. 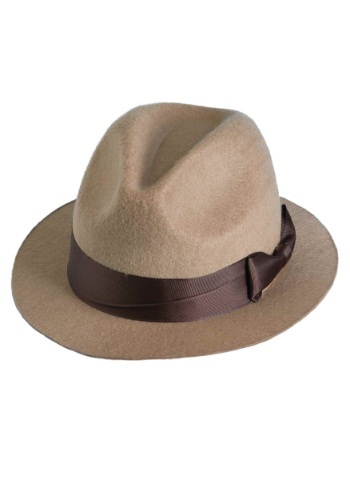 So next time you feel the need to work in the hot sun searching for the world's largest ruby in the ruins of some ancient civilization, don't forget to keep your head in the shade and looking stylish with this tan fedora. It's perfect if you want to be a museum curator that decided to try out some field work only to run into some trouble, or if you are playing the greedy villain whose ultimate demise is the desire for even more wealth.